On October 5, 2018 at about 7:00 pm, SPPD officers were dispatched to the area of Mockingbird Lane and Raymond Hill Road for a report of a suspicious vehicle. 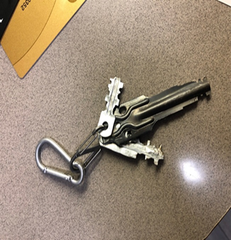 Officers made contact with the driver and upon running a records check, they discovered he had a felony warrant from a neighboring jurisdiction. After he was arrested, the suspect admitted that he had narcotics in his vehicle. 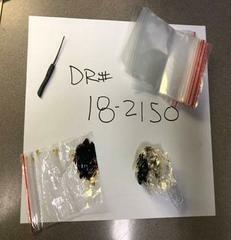 When officers searched the suspect’s vehicle, they found large quantities of methamphetamine and heroin along with a scale and narcotics paraphernalia. 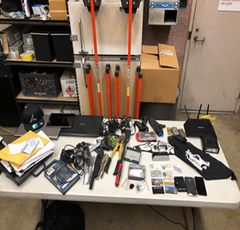 During the search, officers also found stolen property, stolen mail and United States Postal Service arrow keys, which are used to burglarize multi-unit mailboxes. The suspect was identified as Lloyd Eppie, a resident of Los Angeles. 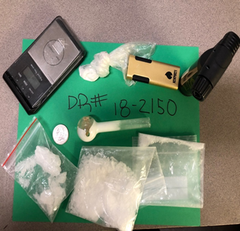 He was arrested for numerous charges including possession of narcotics for sale, possession of stolen property, possession of burglary tools and the felony warrant. In addition, evidence relating to the mail and the arrow keys will be forwarded to the USPS Inspectors for further investigation. If you have any further information regarding this incident, please contact SPPD Detectives at 626-403-7280.